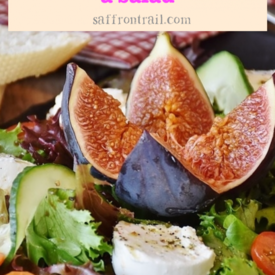 Read this post to learn how to put together an Indian Salad Platter – colourful, delicious and healthy salad with all Indian ingredients. 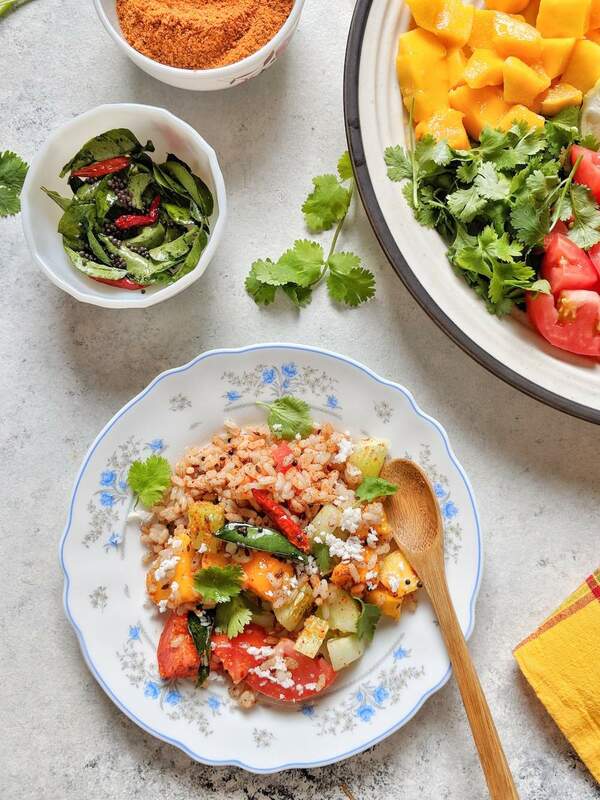 Are there salads in Indian cuisine? While there’s no concept of sitting down with a big bowl of salad for lunch, there are a couple of Indian salads that I can think of. One is kachumber – popular in Gujarati, Maharastrian and Parsi cuisine. It is a mix of finely chopped cucumber, onion and tomato, with lemon juice (or vinegar), salt, red chilli powder and a pinch of sugar. Finely chopped coriander helps brighten up the salad. A spoon or two of this kachumber is served like a condiment to accompany a meal. The second one is a South Indian salad. Kosumbari or kosumalli has soaked moong dal which is drained and mixed along with grated carrot or cucumber and fresh coconut. Tadka of mustard seeds, cumin seeds, curry leaves and green chillies adds extra flavour and crunch. 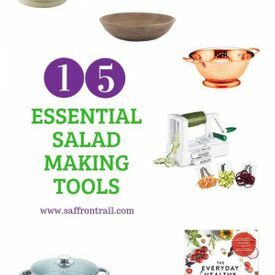 Other dishes like raita and bhel could also fall into the salad category. Try calling cucumber raita as cucumber in yogurt dressing????. The chutneys in bhel perform the role of ‘dressing’ up the puffed rice and veggie mix after all. That apart, nothing stops us from putting together our own versions of Indian salads. Indian ingredients like rice, mango, coriander, coconut and a tadka star in my Indian Salad Platter today. If you are lucky you will still find the last of the mango varieties that you can use in this recipe. No mangoes? You can substitute this with another seasonal fruit such as red guava. Scoop out the seeds of the guava before using though! 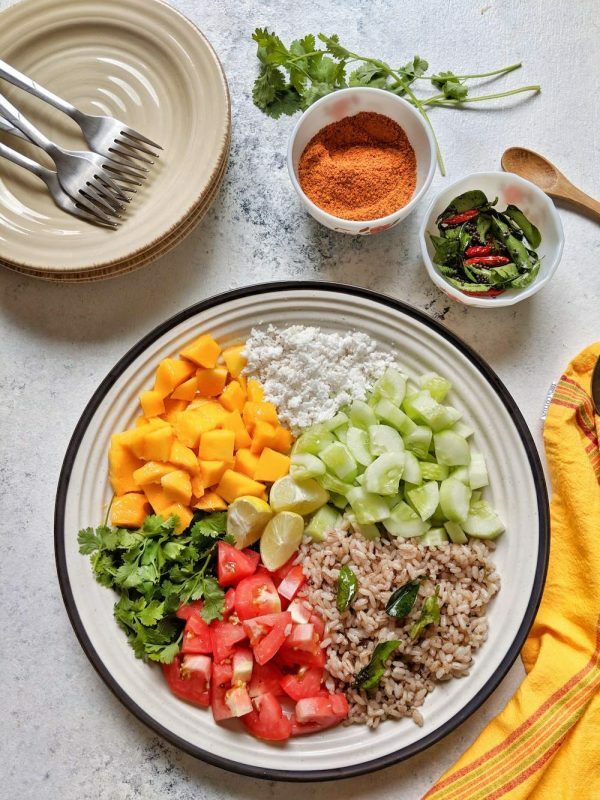 The beauty of this Indian salad platter is that it almost makes a full meal, what with the rice and all that. It’s got spicy, sweet and sour flavours in equal measure, making it totally addictive. The Indian Salad also a hearty way to use up any left over rice. 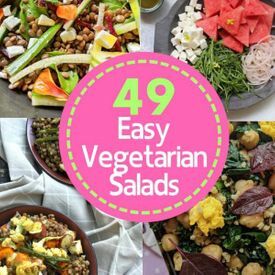 I have used Kerala red rice in this salad. Feel free to use brown rice, unpolished white rice or any other grains such as millet, quinoa etc. To put the salad together, pick a couple of spoons of every ingredient, toss along with lemon juice and a hearty spoonful of podi. Would you like to take a look at the products and appliances I use and recommend for cooking? There’s a special section just for coffee and tea! Drain the soaked red rice and pressure cook with 1 3/4 cups water + pinch of salt, for 15 minutes (keep flame on lowest setting after one whistle for 15 mins). Peel and dice the mango and cucumber. Quarter the tomatoes, scoop out seeds and chop into small bite sized pieces. Cut the lemons into wedges. In a small pan or tadka ladle, heat 1 tbsp of coconut oil. Fry curry leaves, red chillies until they turn crisp. 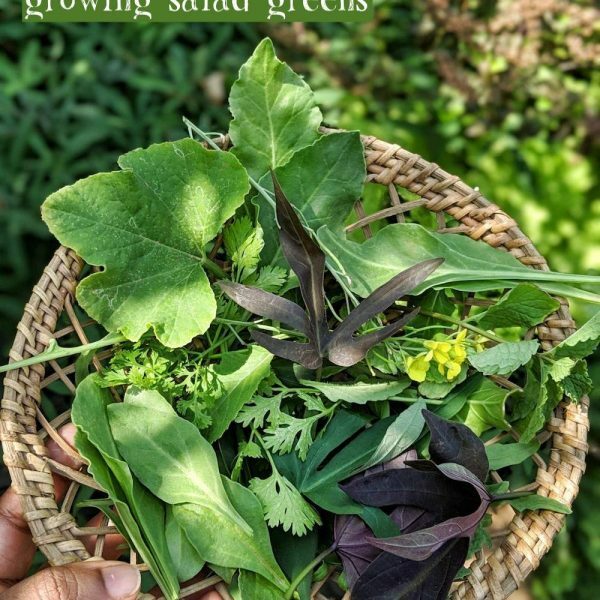 Transfer this into a small bowl. Remove the cooked rice on to a plate and cool for 5 minutes. Heat the remaining 1 tbsp coconut oil in a pan. Add in cumin seeds and crushed black pepper and fry until cumin seeds crackle. Toss in the rice and combine gently. To lay out the Indian salad platter, you need a big sized plate or a platter. 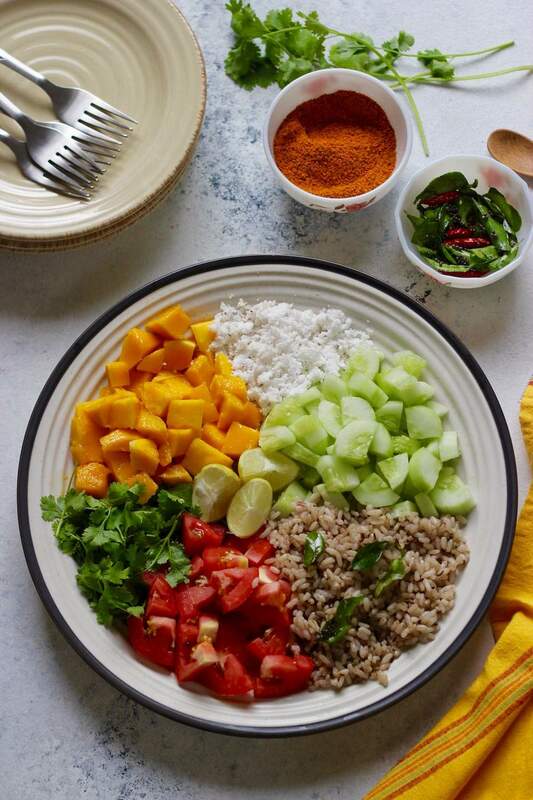 Arrange the rice, mango, cucumber, tomatoes, coconut, coriander, lemon wedges and the fried curry leaf-red chillies as shown in the picture. Serve immediately.